Excuse my use of the term “stress test”, but that’s exactly how I view the challenges that the California grid operator, State officials and energy companies will confront this summer when they have to operate their electric system without the natural gas from the Aliso Canyon Gas Storage facility. As most of you know, the State of California has banned use of the facility for safety reasons. It’s definitely not “business as usual” with Aliso Canyon out of the picture. California takes pride in its renewable energy portfolio, but relies on 17 gas-fired power plants in the Los Angeles Basin and San Diego to meet peak demand and changes in supply due to the variable nature of solar and wind power generation. These 17 power plants are normally supplied by the Aliso Canyon Gas Storage Facility. Other electricity regions also rely on gas-fired generation and available pumped storage hydro projects to manage changes in wind and solar power. If they lost significant natural gas infrastructure, they would be in the same position as California. The opportunities to learn this summer from California’s experience are great. The electric power industry relies heavily on modeling to forecast likely events and necessary investments in electric infrastructure and the fuels to operate power-generating facilities. Hopefully we can argue less about banning fracking and natural gas facilities and learn more about how to operate an increasingly “gassy” and renewable energy portfolio in California under less than ideal conditions. Of course, the weather will dictate the electricity demand and what resources California will use to maintain adequate service, and maintain electric reliability and air quality. The Aliso Canyon Risk Assessment Technical Reportsuggests that without any gas supply from Aliso Canyon, there are 14 days this coming summer during which gas curtailments could be high enough to cause electricity service interruptions to millions of utility customers. Consumer Groups and utility critics questioned the accuracy of the report and called it a scare tactic. 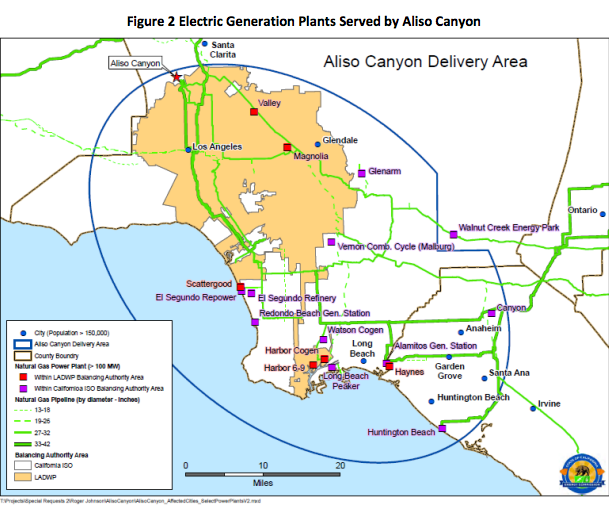 The Aliso Canyon natural gas storage facility can hold up to 86 billion cubic feet (Bcf) of natural gas for distribution to residences, businesses, and electric utilities in the L.A. basin. The Aliso Canyon natural gas leak began in October 2015 and was sealed Febryary 18, 2016. Prior to the leak the storage facility supplied natural gas for 5 million people. At this time, 15 Bcf of natural gas is stored at Aliso Canyon. The facility normally supplies natural gas to 17 gas-fired power plants (total capacity of 9,503 megawatts), large hospitals, oil refineries, and other key parts of Southern California’s economy. Many organized electricity market participants rely on sophisticated models to forecast “what if scenarios” regarding electric reliability and prices. Growing opposition by consumer and environmental groups to new natural gas pipelines and storage facilities is also a fact of life for many in the electric power and natural gas sectors. Indeed many groups truly believe that many electricity markets can get by without additional natural gas facilities or fossil-fired generating plants by relying on energy efficiency, micro grids, and other policy options. Instead of continuing to argue the point, like it or not, we will get some definitive answers in the form of a real live “stress test” this summer since the Aliso Canyon Gas Storage facility is not available to electric power generators. Note: according to the Aliso Canyon Action Plan to Preserve Gas and Electric Reliability for the Los Angeles Basin, the 15 Bcf of storage at Aliso Canyon may be withdrawn via pipeline during critical times. The California Independent System Operator (CAISO), state officials and others are prepared for this summer’s challenge. CAISO also sought and was granted temporary flexibility from the Federal Energy Regulatory Commission to cope with the above challenge. Because of the large percentage of renewables in the CAISO footprint, we’ll see just how electricity and natural gas prices respond given the actual and perceived natural gas supply and pipeline flow constraints. We’ll also be able to measure the performance and market behavior of power generators, natural gas pipeline companies, utility and energy trading companies, assuming oversight from CAISO market monitors and FERC Enforcement. Hopefully federal and state energy regulators will determine what worked and didn’t work, as they did when Eastern and Midwestern Energy Markets experienced severe cold weather during the winter 2013-2014. During the winter 2013-2014, demand side management and oil-fired power generators in many Eastern Independent System Operators were called upon to safeguard electric reliability and mitigate electricity costs. Back then, natural gas prices in New England peaked at $78.64/MMBtu, while Transco Z6- NY in New York and non-NY (PJM) rose to $120.70/MMBtu and $123.50/MMBtu, respectively from January 20-22,2014. At that time, no.2 fuel oil was $22.71/MMBtu. On June 3, 2016, Nymex heating oil closed at $1.4881/gallon or $10.54/MMBtu. California has few oil-fired generating resources and the drought has constrained hydropower generation. Many power generators and electric utilities in organized and traditional North American electricity markets are becoming more reliant on abundant and inexpensive natural gas to produce electricity. They all depend on the 400 active underground storage facilities and 300,000+ miles of natural gas pipelines to store and deliver gas molecules to their power generating facilities. Problems with natural gas infrastructure are not common, but aging infrastructure is a growing concern as the Aliso Canyon leakage demonstrated. When problems do occur, they can have major impacts immediately on the health and lives of citizens living near the facilities. If natural gas infrastructure is not restored to service then the impacts can affect electric reliability, resilience, electricity and natural gas prices, and the economies of affected States and regions. For the above reasons, organized electricity market participants (ISO New England, New York ISO, PJM, Mid Continent ISO, SPP, ERCOT) and traditional electric utilities in the Southeast, Southwest and Northwest should be watching the developments in California as well and adopt best practices in their own regions. They should also be concerned about the reliability of their gas deliveries and scrutinizing the safety and operations of natural gas pipelines and storage facilities that serve them.